The above isn’t a hoya, as anyone can see. I put it here to explain why I’ve been so slow at attending to other things. The picture is what I see when I look out my office window in the spring. 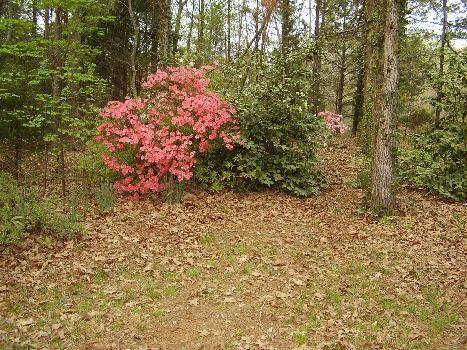 The close up pink bush is an old time favorite Azalea, ‘Coral Bells.’ The lighter pink one in the background is another of my favorites, ‘Sweetheart Supreme.’ I sit and admire the view and nothing else gets done until the last flower fades. From here on, the subject is HOYA! This is not the best picture in the world. It is a picture of the first flowers I had on IPPS-8845 when my plant was only 2 or 3 months old. I have had a lot of questions asked about this one lately so I thought it time I wrote something on the subject. Question: I was told that species IPPS-8845 (aka GPS-8845) is actually Hoya tomataensis. Do you agree with that identity? – too many of my critics to count. Reply: I do NOT agree. I have IML-1632, which David Liddle sells as Hoya tomataensis (I assume this identity correct and will until/if it ever blooms and proves it to be something else. My start is less than a year old and hasn’t put on much growth yet. I also have an older plant labeled Hoya tomataensis that was given to me (no IML#) a year before I got the IML-1632. It hasn’t put on much growth either. Neither has bloomed yet but I see enough differences between the two Hoya tomataensis plants and IPPS-8845 (aka GPS-8845) to convince me that they are not the same species. I have bloomed IPPS-8845 and have many pictures of its various flower parts. I also have a copy of DK’s name publication of Hoya tomataensis. Actually, the only trait I see that both have in common is that both have clear sap. 1). IPPS-8845 is a fast grower and a prolific bloomer. IML-1632 has, so far, shown little tendency to do anything but sit there. The above picture is of a cutting I took from my “mother” plant of IPPS-8845 in October of 2008. The rest of the cutting is out of camera range. It has only the four leaves seen here but the almost bare branches extend in all directions with embryonic leaves here & there. This cutting is growing in a 2X3” nursery flat pot. It has never bloomed but, as you can see, it is about to bloom. I counted 9 peduncles, some nearly as long as the leaves. 2). The leaves of IML-1632 are as flat as pancakes. DK’s name publication of Hoya tomataensis described the leaves as flat. 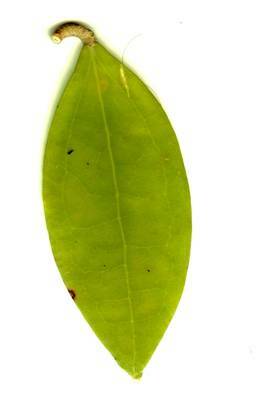 The leaves of IPPS-8845 are, for the most part, convex above and concave below. 3). The costa of IML-1632 is raised above, invisible below and the other veins are from very faint to completely invisible above and completely invisible below, on both of my two plants and in Green & Kloppenburg’s pictures that accompanied their name publication. The costa of IPPS-8845 is depressed above, raised below and quiet conspicuous on the upper surface and clearly visible on the lower surface, as are the tertiary veins and the network of veins between those veins. 4). 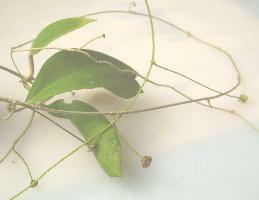 The petiole of IML-1632 is, as DK described the petiole* of Hoya tomataensis. He said it was “ curved, relatively long, terete and not grooved above.” The petioles of IPPS-8845 are not terete. Some are curved but most of those on my plant are straight. They are rounded on the sides and bottom but they are flat above except for about 2 mm. at leaf base. That 2 mm. appears to be the beginning a “channel” that was never finished. They appear as if they may have started out terete but someone took a narrow slice off the upper surface. They are completely glabrous and they lack those rough rings seen on the petioles of IML-1632. * Kloppenburg’s petiole description is in the third paragraph, (third line up from the bottom) of the publication. Here, DK said, “The peduncles are curved, relatively long, terete and not grooved above, 2.5 cm. in length and 0.36 cm. in diameter.” I have never seen nor heard of a peduncle that is grooved above and since most peduncles hang down; stand straight up; or slant outward; there isn’t an “above” that could be grooved. I think it safe to say that the part described in that sentence is the petiole, not the peduncle. Further evidence of this follows in the fourth paragraph, where he gave a more plausible description of a peduncle. 5). In the next paragraph, Kloppenburg described the peduncle of Hoya tomataensis as “essentially glabrous except for an occasional hair cell, about 1.5 cm. long.” The peduncles of IPPS-8845 are glabrous but I detect no hair cells. What I do detect, which is not common, though not truly rare, on hoya peduncles, are adventitious rootlets. Most of those on the rooted cutting pictured above, have from 3 to 5 adventitious roots. As for the length of the peduncles, most of them are about 6 to 11 cm. long and extremely slender. The peduncles on my IPPS-8845 plants are exactly as those in the Kleijn & van Donkelaar illustration. 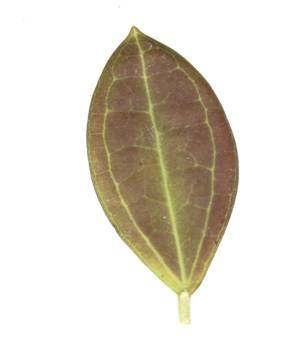 On the other hand, the peduncles in the picture on page 5 of the Fraterna publication appears to be almost the same diameter as the petiole on the leaf adjacent to it and not even as long. 6). Mr. Kloppenburg then described the pedicels of Hoya tomataensis as being 6.7 cm. long. 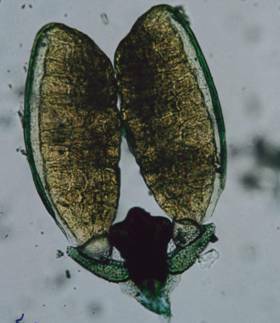 The pedicels of IPPS-8845 are only about 1.5 to, at most, 2 cm. long. I suspect that he was again thinking peduncle but typed pedicel. Left: IML-1642 (Hoya tomataensis?). The nerves are, as Kloppenburg described them, “obscure.” It has been growing in full sun for almost 6 months and still looks the same. Right: IPPS-8845. The nerves are extremely conspicuous. I have another plant of it growing in the shade. Its veins are also quite conspicuous. How could anyone confuse the ugly thing on the left with the lovely thing on the right? 7. The seventh difference that I see, may (or may not), eventually, prove to be no difference at all. I have small plants of both these species sitting side by side in a sunny location. The leaves of IML-1632 (so far) have remained light green in colour, with only the raised costa still paler green (almost white). The leaves of IPPS-8845 are a lovely shade of brown, but the costa and all of the veins and reticulations are light green. 8). The leaves of IML-1632 are thick and extremely stiff and waxy but with a dull surface.. Those of IPPS-8845 are thin for hoya leaves. 9). Here, I must assume that the illustrations published by DK in Fraterna 17:2 are correctly labeled (many of his pictures have not been correctly labeled in the past but with digital photography, he shouldn’t have much trouble getting his labels right). The difference I see there is in the pollinarium. DK has written, many times, in his various publications that one should be able to identify a hoya by its pollinarium alone. In this, he was echoing R. Rintz, who made the same claim. I do not believe that but I do believe that if two plants are the same species then their pollinaria will match. The pollinaria of IPPS-8845 and that of Hoya tomataensis, do not match, unless DK’s pictures on page 4 of the above cited publication are mislabeled, as many of Mr. Kloppenburg’s pictures are. Left: Kleijn & van Donkelaar’s illustration of an IPPS-8845’s pollinarium. Note the long, very shallow, upturned translator arms (called wings by some) and the long curved tails attaché to the caudicle bulbs). Right: This is my photo of an IPPS-8845 pollinarium. It also has long, shallow, upturned translator arms and the caudicle bulbs are long tailed. All other flower parts also match those in the Kleijn & van Donkelaar illustration. Above is DK’s Hoya tomataensis pollinarium picture: Note that the translator arms are short and cut straight across (not in the slightest bit upturned). Plus that, the part that gives the caudicle its name (the tail) is so short it appears to be missing. Actually, this pollinarium greatly resembles the pollinarium illustration, labeled as belonging to Hoya dolichosparte on page 472 of the Kleijn & van Donkelaar publication. * The only case I know of where the colour of the corona appears to change at different bloomings is Hoya kerrii and that is not a true change. 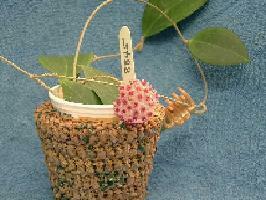 The colour of a Hoya kerrii comes from the dark coloured sap inside its transparent corona lobes. Heavy watering causes the sap to be thin and extremely high temperatures causes it to “boil” over and spill out, leaving the corona several shades lighter in colour than when it blooms under cooler and drier conditions. The IPPS-8845 came to me via a joint order from Paul Shirley in the Netherlands. Paul Shirley is now owner of the former van Donkelaar nursery. He has retained the van Donkelaar numbers but uses the prefix of GPS. Note: Torill Nyhuus wrote and article in Hoyatelegrafen #3 2007 and showed pictures of the same two clones pictured above. She accounted for the difference in flower colour to be due to camera and light conditions. That could be true of the corolla colour but not the corona colour. I doubt seriously that the same differences would occur when someone (me) took pictures of the same plants at different times, several thousand miles away. In the five years I have had IPPS-8845, the flowers have had the same shade of the same colour each time it has bloomed. I must also add that Ms. Nyhuus wrote as if these were two clones, the one with the lighter coloured corollas being IPPS-8845 and the other being the Hoya tomataensis holotype. 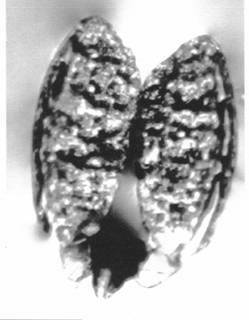 Ms. Nyhuus wrote: “I’ve talked to David Liddle, Dale Kloppenburg, Paul Shirley and Ted Green about these plants, etc.” She did not say that she asked if IPPS-8845 was the same species as Ted Green’s type, but the implication was that she had, as she added, “If Ted’s type plant (the one he has taken material from to the type herbaria) is the same clone as one of the others mentioned, couldn’t be confirmed.” Carin Wahlström translated the Hoyatelegrafen text for me. I am (more than Kloppenburg and Liddle; less that Paul Forster) something of a lumper, but I cannot agree that two plants with this many differences could be a single species and certainly not a single clone of a single species. So, again, I say, “ain’t no way, no time, no how that IPPS-8845 could be Hoya tomataensis. * I spent most of my youth in trouble because my mother was forever mixing the names of my siblings and me. She’d call out from the kitchen, “Celetta, come here, immediately.” I’d hear her repeat it several times and never responded because, “I’m not Celetta.” Celetta is my sister. Or she’d demand that Bobby (my brother) do something and then lower the boom on me when I didn’t do whatever it was that she shouted at Bobby to do. Sometimes, she’d even call me by her sisters’ names. When I had children, I sometimes caught myself making the same mistakes. When I take the time to proof my own writing, I frequently catch entries where I intended to write the name of one flower part but, instead wrote another part. Such errors become part of the record when one proofs one’s own writing; when one doesn’t proof at all or when a person without knowledge of the subject does the proofing. I find it best to let what I write sit for a few weeks before I proof and publish it. That way, the mistakes are more noticeable to me. I am sure that there will still be some who disagree with me. I know that David Liddle does. He and others may be right and I may have to “eat crow” somewhere down the line (I’m developing a taste for it)! I don’t think that will happen because I can’t believe that I could possibly observe so many difference between two plants of a single species. David says that IPPS-8845 is the holotype species of Hoya tomataensis, however, in Green and Kloppenburg’s publication of the name, not a single reference was made to IPPS-8845. Kleijn & van Donkelaar published their paper which featured this species, and it well illustrated 3 years before the Green & Kloppenburg publication. If it were IPPS-8845, one would think they’d have said so. Instead, they cited “19086 (BISH) ex hort. but did not say whose 19086 it is. Kleijn David & van Donkelaar, Ruurd, Notes on the Taxonomy and Ecology of the Genus Hoyan in Central Sulawesi in Blumea 46 (2001) 457-483. Nyhuus, Torill, in Hoyatelegrafen 7(3):14 (2007.